Pyrex is a leading brand of traditional heat resistant glass and ceramic products. 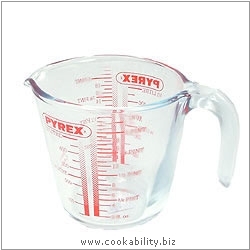 The classic Pyrex measuring jug 1pint jug shown. Graduated in Imperial 1fl oz increments and Metric 50ml increments. These increments are doubled on the 2 pint version but the graduation scale ends at 1.5 pints. Suitable for use in microwave, oven and freezer.